Live streaming has come a long way in the last decade. Back in 2008, I covered the U.S. Presidential Primary in New Hampshire with a Nokia N95, and streamed in 3G, using Qik. Other options at the time were Flixwagon and Kyte … ever use one of those? Luckily, today, we have mobile devices that can record in HD and stream over 4G and/or wifi. The user experience is a lot better for both live streamers and viewers — which is why live streaming on mobile apps is becoming more and more popular. Want to live stream videos from your smartphone or tablet? You’ll find there are a couple apps to choose from that’ll let you share live video easily with your network. The trick is knowing which one best fits your needs. To help you choose, let’s take a look at the best features of four of the most popular new live streaming apps available today. Best feature: The video from your broadcast is available to viewers for 24 hours after it ends. Ever seen someone tweet a link to their live broadcast, only to click it and find out the broadcast is over and there’s nothing there to watch? 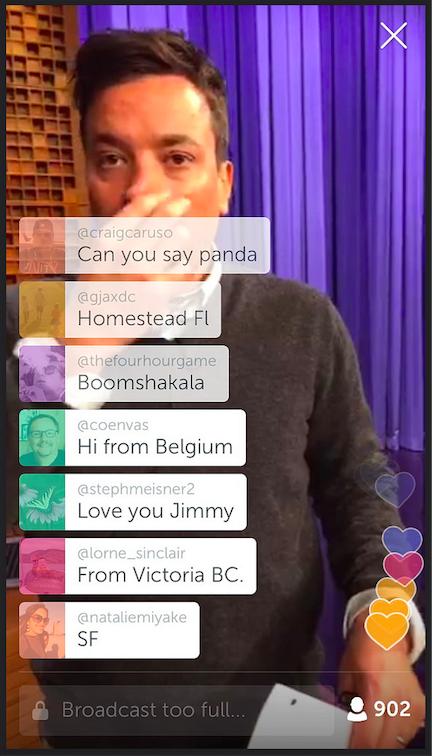 While that can happen on Meerkat, it won’t on Periscope. Why? Because Periscope will save your videos to the app by default, and they’ll be available for viewing by your followers for 24 hours. (Even though this is the default, you can delete them manually if you want to.) You also have the option of saving your videos to your phone’s camera roll. There’s also a list on the Periscope app of the most recent 15 streams. From that list, you can click on the ones that are archived, watch the video, and see all the chat messages appear as they were made in real time. It’s almost like you’re watching it live. Want to learn more about using Periscope? Read this blog post for more tips and tricks. Best feature: Your viewers can text chat with you during your live broadcast. 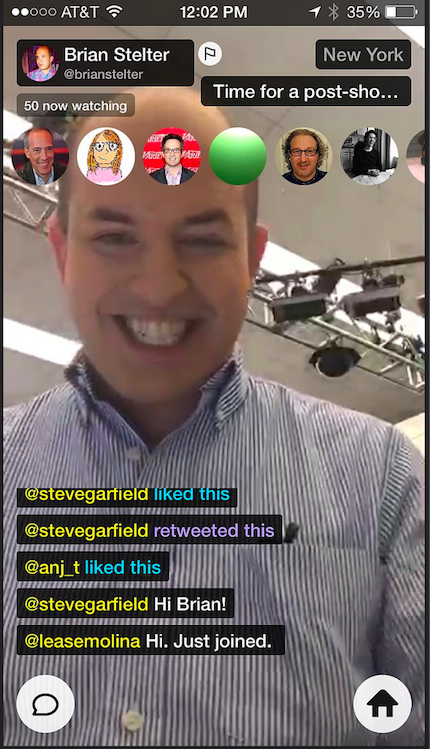 Chat is a fun way to connect with your followers, and Meerkat takes full advantage. When you live stream on Meerkat, a chat stream appears and scrolls upward from the bottom of your mobile device. This is fun for viewers to interact with one another and with the broadcaster, if he or she is watching the chat. The video experience is powerful already, but the added chat feature can lead to developing stronger relationships with your followers. The user interface is really nice: New messages coming in stay at the bottom of the screen so they don’t cover too much of the video. You can also scroll backward to read any messages you missed. Finally, if the viewer has selected this option in the settings, then his or her chat messages are posted to Twitter as @reply messages so you can continue the conversation on Twitter. Very powerful connecting stuff here! 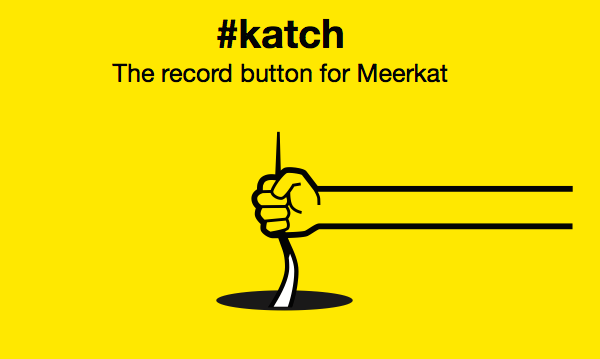 Another great feature: Katch Kats for Meerkat lets broadcasters record and post their live streams to YouTube. Whereas Periscope automatically records your live stream and gives broadcasters the option of saving it to their camera rolls, Meerkat doesn’t automatically record it. However, if you use the #katch hashtag in your broadcast title or comment with #katch during your stream, then your video will automatically save to YouTube. Viewers might request you to do this by using #katch in the comments, but the broadcaster him or herself must use the #katch hashtag in order for the video to be saved. When the broadcaster uses the hashtag, Katch Kats automatically creates a YouTube video and notifies followers by posting a link in the comments. Best feature: You can host your live stream on a web page and send followers there. Using Hang w/’s simple web widget, you can point people to your own web page to drive traffic to your website. 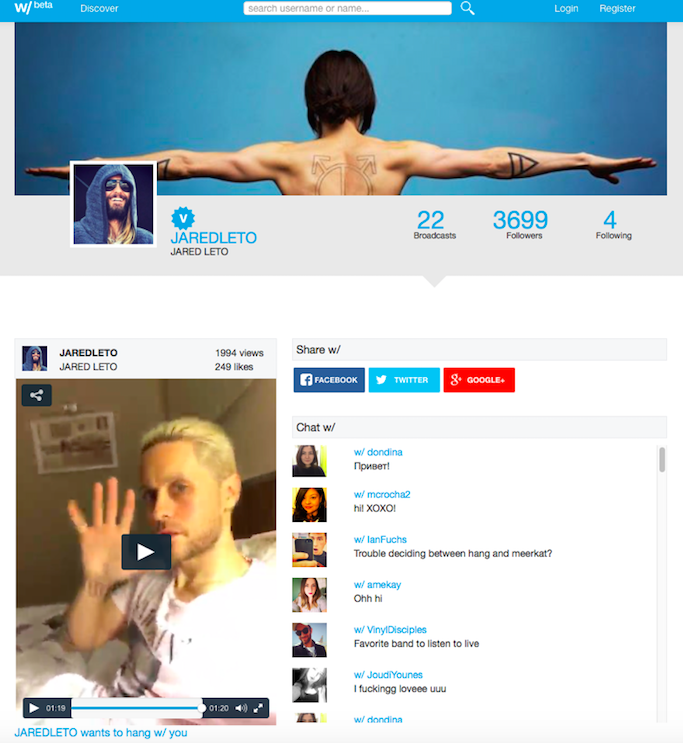 In addition, Hang w/ lets you own your own user page where followers can watch your live streams. The app will point viewers to this page and they can watch it there. This makes it easy to promote a live stream ahead of time. Best feature: You can set up your own channel, invite others to stream live to it, and manage which live stream is broadcast. You can also hook up your Stringwire account to YouTube and live stream there. These are pretty advanced features that’ll be fun to experiment with. What’s a great use case here? 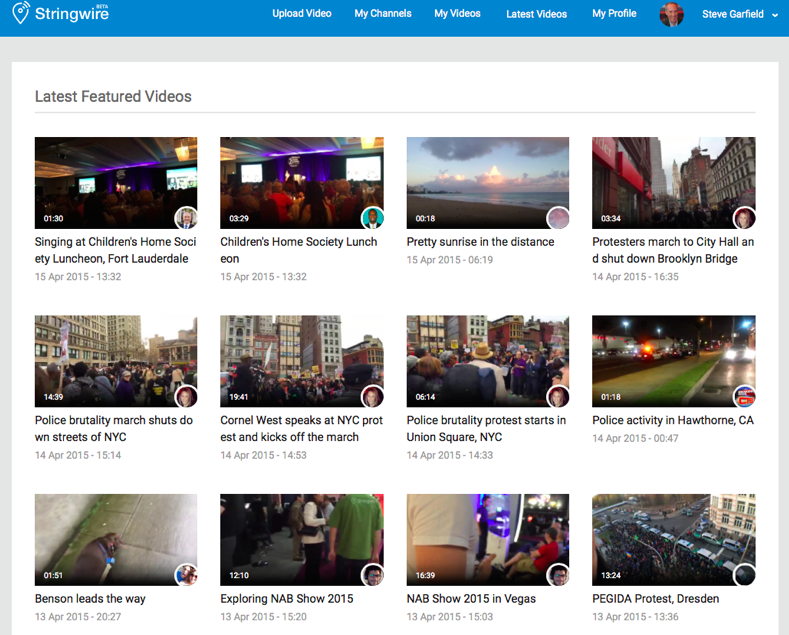 Stringwire is a good platform to use if you want to get your video seen on broadcast or cable news, as it allows you to direct a multiple-camera broadcast and stream live to your Stringwire account or to YouTube. As a long time video producer, I felt comfortable shooting in landscape mode with Stringwire. NBC and other news outlets will be looking at Stringwire for videos to share on air, so in this case, shooting videos in the landscape orientation is the best choice. And keep in mind that when you share on Stringwire, other people could potentially make money off your videos. All of these apps are viable options depending on your needs. The best way to figure out which of these apps is right for you is by figuring out where your audience is by trying them yourself and gauging their performance. Currently, I’ve got them all. They’re being updated regularly, so you’ll see bug fixes and new features added. Sometimes an app might have trouble connecting, so you can move on to the next one.